You are here: Home / Clock Funeral Home / What is the one thing that is truly yours? What is the one thing that is truly yours? What is the one thing that is uniquely yours or your pet’s that no person or other pet has? Your thumb or paw print! Did you know that you can engrave not only a person’s thumb, hand or foot print, but your pet’s paw, hoof or even beak/claw print on a piece of jewelry? Hospitals take an ink print of a newborn’s hand or foot then place it in on the birth certificate and give it to the parents. Many parents like to frame the certificate. Over the years, funeral homes started taking an ink print of the deceased’s thumb print before burial or cremation. After the funeral was over, they were able to offer the survivors a keepsake made with their loved one’s print engraved on the item. The funeral home’s referred to this as making a “Thumbie” (The name the first keepsake provider gave these imprints). Thumbies became a huge hit! Over time, families of the deceased shared they found comfort in having something personal of their loved one with them. It wasn’t uncommon for Thumbies to be made and kept for a later date and given as a gift to a son, daughter or grandchild on a special event such as a marker birthday, graduation or wedding. It didn’t take long for this catch on in the pet world. Pet loss centers started taking clay paw prints of a person’s pet prior to cremating them and would return it with the pet’s remains. Pet parents were grateful for the clay print, however what they really wanted was the ability to have the paw print on a piece of keepsake jewelry. What’s really great about human or pet print jewelry, is that they can be enjoyed while the person or pet is living and then act as a memorialization keepsake after death. Prints can be acquired both manually via an ink or clay medium, otherwise scanned digitally via a specially designed app placed on a smart phone. From there they can be engraved onto gold, silver, or sterling. The most common and affordable option is sterling. It’s not uncommon to have both a pet’s paw print and a human’s print on one piece of jewelry. So next time you want to give that special someone a very personal one of a kind gift, think about what’s typically the most important thing in a person’s life – family! Please remember that family is not limited to people. In fact, for many people, pets are their only family! If you can think of it – it can be created! Please note that there are many companies that offer to do this service – check out reviews or seek out your local pet loss provider or even a funeral home to work with a reputable company that you will not have to worry about identity theft or product quality. Meadow Hills, Legacy Touch, New Memorials Direct, and Crescent are some of highest quality and most trusted pioneers and names in finger or paw print jewelry. Please take a minute to answer the below reader’s poll. I have a heart pendant that is made of Zeus and Lola’s pad prints. I lost them both to cancer a year ago…it’s literally the most valuable piece of jewelry I own. Priceless. I think this would make a wonderful gift to a special pet parent. Beautiful! What a nice way to remember your pet! I love this!!!! And, yes! I would definitely be interested in doing this with my furbabies pawprints! I love pet related jewelry and I’ve seen some beautiful memorial pieces. I have been wanting to do my dog’s paw prints for ages now. I really need to get to it! I do think tributes like this are important ways to remember your pets and deal with loss- I made paw prints of Isabelle and Cookie with my kids in clay. I don’t wear much jewelry but I do like Pug related things now. How beautiful, I love these! I never knew it was customary to get a person’s finger print as a keepsake after they passed, I think that’s lovely. I really like that last pendant with both the fingerprint & the paw print intertwined together! I would buy something like that for sure. That is a really great idea! I wish I had known about this before Jewel passed away. It would be a wonderful way to keep her close to my heart. This is a beautiful idea! I know that many people would love to have a necklace like that. This is a really lovely way to remember our pets. 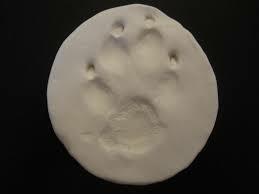 I remember when I had to say goodbye to my 18-year old cat Gretta and they did a paw print mold. No one told me that the molds were not water-proof. I planted a small memorial garden in my yard and the first time the sprinklers went off the mold was completely destroyed. It was devastating. I so wish I’d had something more permanent. What you shared makes me sad. You brought up a good point about not knowing the molds were not water-proof. I will make it a point to make pet parents aware of this. If you have an ink print a new mould can be made that is water proof. I’m glad that Gretta touched your heart. Such a sweet and wonderful way to remember a pet. These look beautiful! This would be a great gift and I’d love to have a pendant of the girls’ paw prints. What a great idea! I had my boys’ paw prints tattooed on my leg. How awesome is the idea of a necklace with this too! This is such a wonderful way to remember our Pets. I am sharing to my social networks. Do you sell these items Jodi? Sorry for the delayed response – I was on vacation and just returned. Yes, in fact I do sell these. Please feel free to reach out with any questions. What a great idea. I have paw prints of three wonderful kitties who have made their journey.